I got home this afternoon and just wanted to update on how my eating went. I think I will weigh in tomorrow or the next day. This morning's breakfast at the hotel buffet was scrambled eggs with little pieces of ham and a bit of sausage gravy and coffee with half and half. Lunch was Indian food at a buffet, and boy was it good! It was very well done. I did not have rice or naan, and it was still great. I had a Tandoori chicken drumstick, some butter chicken, a few bites of paneer and eggplant, and a big plate of salad with lettuce, spinach, tomatoes and cukes topped with Ranch dressing. In the afternoon I had an Americano with a splash of cream and sugar free white chocolate syrup. 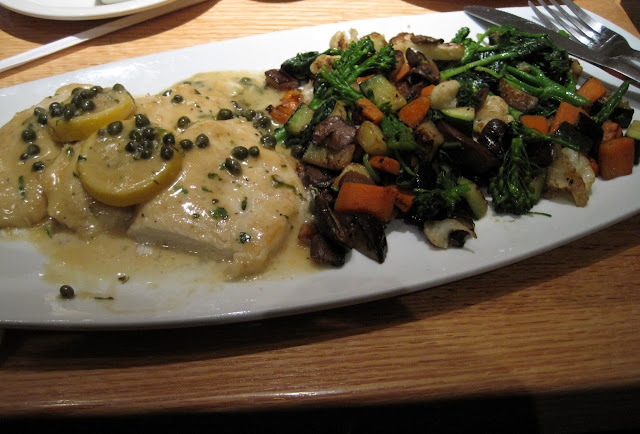 Chicken piccata from California Pizza Kitchen. I asked for veggies instead of pasta and it was fantastic! I didn't eat the carrots but the rest was amazing: broccoli, mushrooms, cauliflower, zucchini, spinach, and eggplant. YUM. I ate half in the restaurant and the other half for dinner tonight. Loved this. That's all I've had today but I may throw in a snack this evening because I am hungry. I am hoping my moderation and eating low carb on this trip was enough to at least not GAIN. I suppose I'll get back to counting tomorrow. Are you kidding me??? Low carb? Check their nutritional website. Had you asked them not to bread the chicken and serve the sauce on the side you would have had a better shot at low carb. Even if you took half home you are still looking easily at 700 calories plus both nights - even with veggies that are soaked in butter. Not sure about your measurements but these heathy habits you're developing seem to be coming more and more natural to you. Behavior and thinking modification will benefit you for a lifetime. Not to mention your child is watching and learning lifeskills from your every move. Those pasta replacement veggies looked waaaaay more delicious than old grains anyhows! It looks so colorful and tasty. Good choice! Don't be discouraged if the scale is up a few pounds. You've been traveling and eating more sodium and probably drinking less water. This plus steroids may equal a small but temporary gain. You inspire me so much that I too can do this!!! I love your blog; thank you so much! !